Monday morning means One Minute Monday – in which we explain a single fact on skills or employment in 60 seconds flat. Overall unemployment is falling year on year and did not rise as dramatically as expected during the recession. But youth unemployment, already rising before the recession, has proved far more problematic. 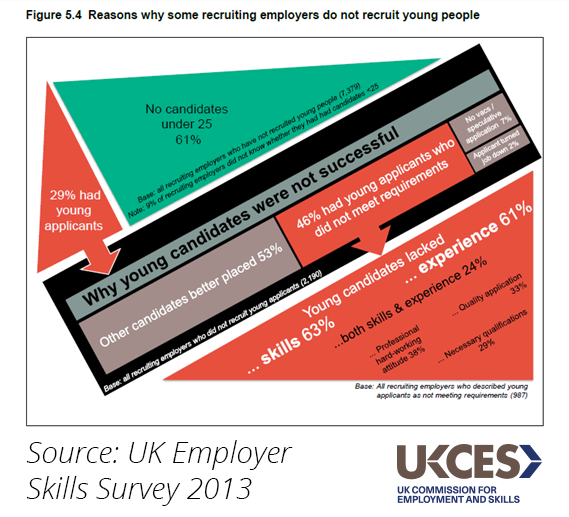 Why do some employers not recruit young people? Our UK Employer Skills Survey 2013 asked employers whether they had recruited any young people into their first job in the last two to three years, and, if not, why not. Only 29% of those recruiters said they had had any applicants under 25 and, of those, 46% said the young applicants did not meet the requirements for the job. Skills and experience were identified as the key areas in which unsuccessful applicants were lacking. It is worth noting that these employers are in the minority – around two-thirds of employers who recruited in the last two to three years had recruited a young person. To find out more about the dilemma young people face in finding employment read our ‘Catch 18-24’ report or if you’re in a hurry, why not give our previous One Minute Monday on preparedness of first-time employees a read. If you have thoughts on the recruitment of young people you can tweet us @ukces using #oneminutemonday or comment below.